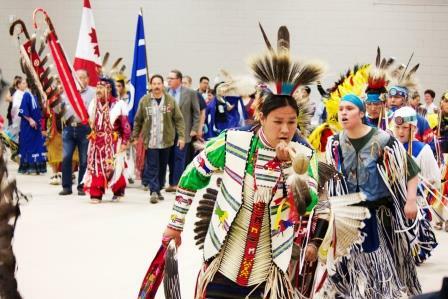 BRANDON, MB – A capacity crowd is expected to participate this week in the annual Graduation Pow Wow at Brandon University (BU), a celebration involving singing, dancing and a giant pot of wild meat stew. This year, 47 Aboriginal students are receiving BU degrees, including Shelli Flett from Kinosao Sipi Cree Nation, a community on the north shore of Lake Winnipeg. Flett is completing her education degree, after earning a Bachelor of Physical Education Studies in 2011. The Graduation Pow Wow will feature drum groups, dancers in full regalia, and a stew made from 80 pounds (36 kgs) of elk, moose and deer meat. “That’s never been done before on the BU campus,” says McCorriston. The Pow Wow takes place at BU’s Healthy Living Centre, Thursday, May 29, starting 6:30 pm. Participants and invited guests will include grads and their families, community member and elders; Grand Chief of Assembly of Manitoba Chiefs, Derek Nepinak; President of Manitoba Metis Federation, David Chartrand; MLAs for the two Brandon ridings, Member of Parliament, Brandon-Souris, Larry Maguire; and Acting Deputy Mayor, City of Brandon, Shawn Berry.